FILE - Salvadorean migrants climb and jump over a fence to get to the Guatemala-Mexico international border bridge in Ciudad Tecun Uman, Guatemala, Nov. 2, 2018. More than 750 million people, or 15 percent of the world's population, would move permanently to other countries if given the opportunity, and the same percentage are not deterred by talk in a number of political circles about curbing immigration. These are the findings of a recent Gallup poll, which looked at the desire by people around the world to migrate. Gallup found that the desire to go to another country permanently climbed between 2015 and 2017. This marked an increase of one percent from the period spanning 2013 to 2016. Gallup conducted interviews with close to half a million people in 152 countries for the survey. 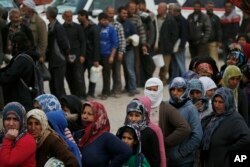 Syrians line up for food at a distribution center in the northwestern city of Afrin, Syria, during a Turkish government-organized media tour into northern Syria, March 24, 2018. The reasons that motivate people to want a life away from their home countries remain the same, said Gallup's global managing partner, Jon Clifton. "The two biggest things that we see that cause people to want to leave is some sort of crisis within the country. So for example, one of the top 10 countries in the world where people want to leave is Syria; nearly 50 percent of Syrians want to leave the country permanently because they've been subjected to war." Clifton said he believed the real percentage in Syria was even higher, but not recorded in the survey, because Gallup was not able to conduct face-to-face interviewing in some areas due to the ongoing conflict. "The other reason is economics," he said. "We see that in a lot of poor countries people want to leave for economic opportunities." According to Gallup, Latin America is showing growing trends toward migration, driven to a large extent by lack of economic opportunities and concerns about safety. As an example, he cited oil-rich Venezuela, which has sunk into crisis under President Nicolas Maduro. United Nations' figures estimate an exodus of around 2 million Venezuelans this year. "Everyone is very familiar with what's been happening in Venezuela. When we ask people if they would like to move permanently, the number is moving in a staggering direction. ... So Latin America is a region where people are more likely to leave than they were before. So the trend is going in a certain way that is not helpful to leaders in the region." Gallup finds that famine and disaster also continue to drive people from their homes in some parts of the world. The desire to leave for another country increased in a number of regions known as areas of origin for migrants. Gallup listed sub-Saharan Africa, the Caribbean, the Middle East and North Africa, in addition to Latin America. Parts of Africa have had to deal with an outbreak of the deadly Ebola virus. 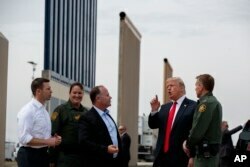 President Donald Trump reviews border wall prototypes, March 13, 2018, in San Diego. The survey finds that the countries where potential migrants wish to settle are more or less the same, and share the same characteristics of economic prosperity and rule of law. "For the past 13 years that we've been doing this, we found that the No. 1 destination for migrants has always been the United States. Despite what policies and what leaders might be saying, people still see that this is one of the best economic opportunities for them in the world," Clifton said. U.S. President Donald Trump has said he wants to build a wall along the southern border with Mexico to stop migrants. The issue has been a sticking point in budget negotiations on funding the U.S. federal government. Clifton said the U.S. is a draw for many potential migrants because they have family members in the country. The Gallup poll said one in five migrants, or 158 million people worldwide, say the U.S. is their desired future home; however, the survey said one in six Americans would like to go to another country — the highest number to date. Faisal Grdawe, center, 18, from Syria gestures in front of the National Reception Center For Asylum Seekers in Tirana, Albania, June 6, 2018. Gallup's Clifton notes that the Balkans exhibit high rates of migration desires, which point to increasing dissatisfaction with the situation in their respective countries. He adds that the trend is especially concerning since it's affecting the youngest and most educated segment of the population. "When you have educated people that would like to live in another country and people lacking education that want to move to your country, we see that it's a real issue in terms of brain drain or lack of brain gain. We see this as a seriously concerning issue for leaders," Clifton said. The Gallup survey said in Albania, for example, 60 percent of people surveyed expressed a desire to migrate, marking the highest rates in any European country. Clifton cited dissatisfaction over incomes as well as purchasing power. Other parts of Europe have experienced a migrant crisis in recent years with thousands of refugees and migrants dying while trying to reach the continent, said Gallup. Separately, Gallup noted that in all regions of Asia, "the percentage of adults who would like to move to another country permanently has remained flat."